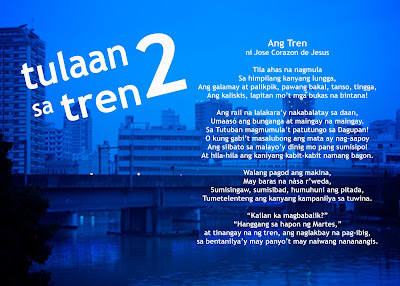 The National Book Development Board (NBDB), Light Rail Transit Authority (LRTA), Vibal Foundation, and Book Development Association of the Philippines (BDAP) are giving aspiring poets a chance to have their poems posted in LRT trains as part of the Tulaan sa Tren readership promotion campaign. 1. The contest is open from 22 June 2009 until 22 July 2009 to all Filipino citizens of all ages. 2. The NBDB will accept original, unpublished poems with the theme Journeys/Paglalakbay. Entries may be in English, Filipino, or any of the regional languages (with English or Tagalog translation if written in a regional language) and should be up to 200 words long. Only one (1) poem per author will be accepted. 3. The Board of Judges will select three (3) winners each for the English and Filipino categories. For each category, the Grand Prize winner will receive P5,000.00, second prize winner will receive P3,000.00, and third prize winner will receive P2,000.00. Winning entries will be posted in LRT trains alongside the works of established Filipino poets and will be published in a compilation of Tulaan sa Tren 2 poems. The NBDB shall share copyright with the authors for their winning poems for purposes of broadcast and/or publication in the NBDB’s readership campaigns. 5. The winners will be contacted by the NBDB prior to the launch of Tulaan sa Tren 2 and will be awarded during the project launch tentatively set in August. hey, i should have posted this over at our bulletin board in school. Invite others to join too. Hope we have our poems posted in LRT Trains. Please take note that this contest is extended till July 30, 2009.
oh my gosh! sayang, i only knew about it now! i should've joined the contest. i love reading the poems in LRT pa naman. wahhhh! frustrating! but anyway. thank you na rin at nabasa ko. hehehe.